Celebrating 30 years of the Order! 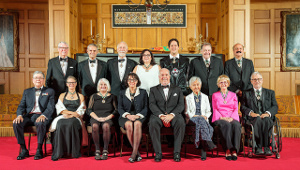 2019 commemorates three decades since the establishment of the Order of British Columbia. 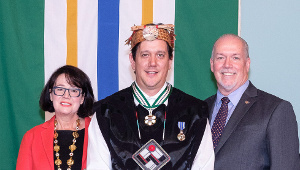 Since its inception, 432 British Columbians have been appointed to the Order from all regions of the province, and in numbers generally proportionate to a region’s population. The Order was established by statute on April 21, 1989, to recognize those persons who have served with the greatest distinction and excelled in any field of endeavour benefiting the people of the Province or elsewhere. The Order represents the highest form of recognition the Province can extend to its citizens. 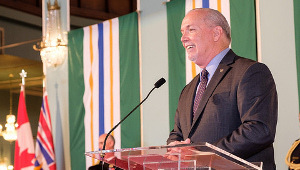 The Order will be bestowed on the most outstanding British Columbians possessing the above qualifications annually. 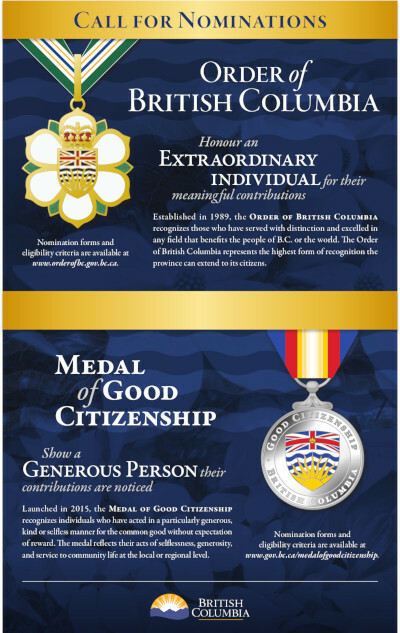 Any person is welcome to nominate a deserving individual as a candidate for appointment to the Order of British Columbia. Nominations and letters of support occur annually and must be received by the first Friday in March to be considered in the same calendar year. Nominations received after this will be included in the selection process for the following year. Click here for nomination form and more information. All nominations are confidential. Should your nominee be unsuccessful, you will be informed by letter and have the option to carry forward your nomination for consideration in the following year’s selection process.